Streamlined Backshop offers a wide variety of DCC decoders and installation components for sale. These products are differentiated by many features. One of the most critical features and criterion for decoder selection is the electrical interface. 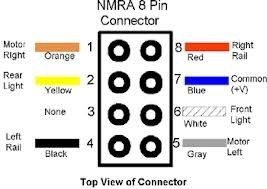 The NMRA has developed a Recommend Practice document that is used by manufacturers to insure consistent application of the many decoder electrical interface connector types in use today. There is no right or wrong connector, only the one that matches the locomotive installation or best meets the needs of your project. Here are examples of the most common types of connectors in use today. 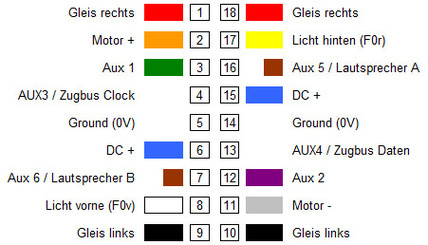 7, 9, 11 (depending on decoder type) single wires with free ends. 6-pin plug to NEM651 standard (i.e. "small interface"). 6-pin plug to NEM651 standard (i.e. "small interface") directly on decoder. 8 pin plug to NEM652 standard (i.e. "medium interface"). 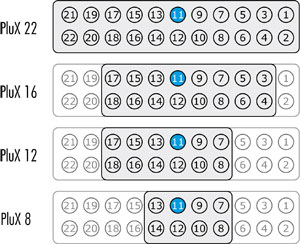 9-pin interface to JST standard based on 9-pin plug and socket connections directly on decoder. 18-pin interface to NEM 662 standard based on 18-pin plug and socket connections (one anti rotation pin as index) directly on decoder. 21-pin interface to MTC standard based on 22-pin plug and socket connections (one anti rotation pin as index) directly on decoder. Please refer to the 21MTC Connector page for additional details about the application and use of this connector. "PluX" (16-pin pictured) interface to MTC standard based on 22-pin plug and socket connections directly on decoder. 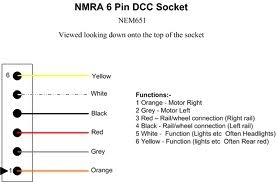 Additional information on many DCC connectors can be found on the European Union of Model Railroad and Railroad Fans MOROP website.